Happy New Year and thanks for coming back for another year of monthly extremes! If you’re unfamiliar with the article, let’s get you caught up to speed. 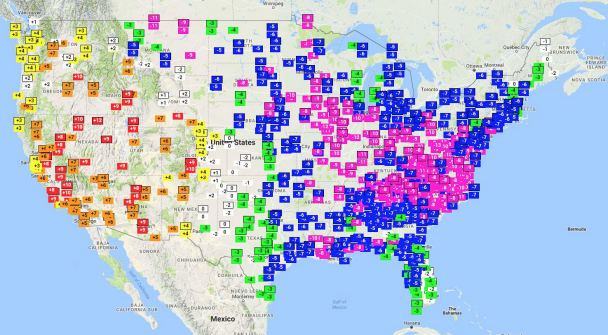 Each month we scour the continental U.S. looking for the warmest, coldest, wettest, snowiest, sunniest and cloudiest locations. So we don’t end up with Death Valley and Mount Washington month-after-month in the temperature extremes, we don’t look for the hottest and coldest single day temperature but instead we find the location that was the most above and below their typical monthly temperatures. Wettest and snowiest are pretty straight forward; whoever accumulates the most, wins. Finally, sunniest and cloudiest are determined by calculating the average amount of daily cloud cover (or lack thereof) over the entire month. Along the way, I’ll share some interesting tidbits about the month at each location as well as how the rest of the nation fared. So with all that in mind, let’s jump into the first month of the New Year! We’ll start out west where persistent ridging really let things heat up during the month of January. 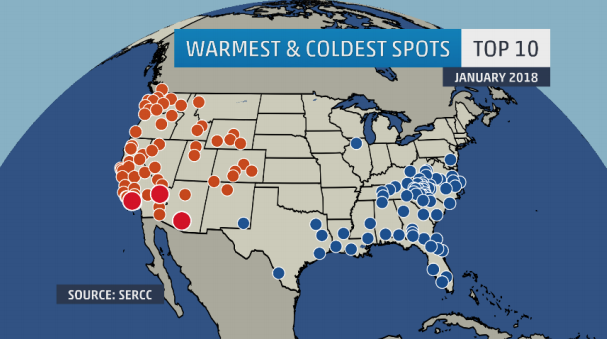 The warmest spot in the U.S. was the town of Elko, Nevada. Located in the desert Southwest’s Great Basin region, Elko is the largest city within 250 miles in any direction. Being a desert locale means Elko is no stranger to extremes. Summer days can climb into the triple digits and heavy snow can fall from November through late April. Being we are in the heart of winter, one would expect Elko to be a chilly, snowy, landscape. However, the pattern this January was anything but average. 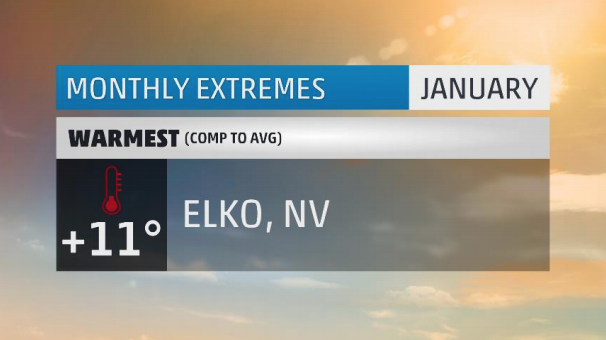 This was Elko’s 4th warmest January on record with records going back to 1890. All 31 days of the month saw above average temperatures, 18 of which were at least ten degrees above average. In a month where average high temperatures range from 36 to 37 degrees, 30 days ended up warmer than that making for the 4th most in any January. The warmest high temperature was a sultry 59 degrees! That was enough to be the 13th warmest January temperature ever recorded in Elko. All 31 nighttime low temperatures were also above the typical average of 15 degrees – the most ever in any January. It did manage to snow – a whole 1.5 inches – but that would fall nine inches short of the average for January. This was Elko’s third month in a row with above average temperatures and the 6th warmest period stretching from November through January. Temperature extremes this January were pretty evenly split between those east of the Rockies and those west. From the Rockies on west it was runaway warm. Eighty-three cities would end the month having one of their top ten warmest Januarys on record. This also includes our friends in Hawaii which saw their warmest January on record! East of the Rockies was a different story. January started out brutally cold as wave-after-wave of Arctic air spilled into the Midwest, Northeast, and Southeast. Some late-month modification let some northern tier cities thaw out, but from the mid-Atlantic on south, it was a particularly cold January. Some 70 cities would end up having one of their top ten coldest Januarys on record. If January had ended on the 15th rather than the 31st, you would have seen some gnarly looking temperature deficits across the board from Maine to Florida. However, some warmer weather from the middle of the month onward helped to chip away at anomalies, leaving only a husk of what January started like. 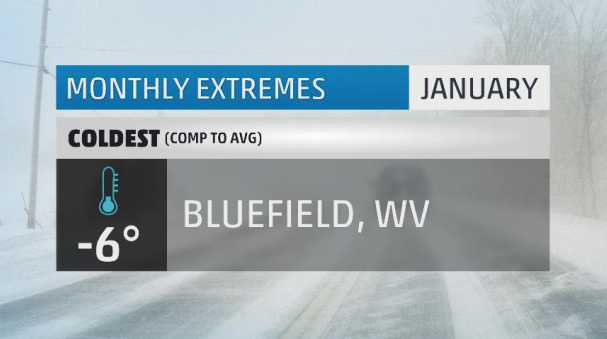 That was case in our coldest spot this January: Bluefield, WV. Located in the heart of Appalachia, Bluefield has the moniker of nature’s only air-conditioned city for its rather hospitable climate year-round. But as you can guess, running the air conditioner in the heart of winter makes for a not-so-hospitable place to be. This January was Bluefield’s 13th coldest on record. Twenty of January’s 31 days featured below average temperatures. Thirteen of those days were at least ten degrees below average, eight were at least 20 degrees below average, and one day was a crazy 30 degrees below average! Going back to late-December, Bluefield had a 14 day streak where the temperature failed to go above the freezing mark. That’s the second longest sub-freezing stretch in Bluefield’s recorded history. However, what started so bitterly cold was quickly moderate by periods of warmer weather. In fact, just five days separated lows below zero and highs in the low 60s. Four Arctic shots would invade the region in January, making for some crazy temperature swings. The most extreme occurred over a twenty-four hour period as temperatures plummeted from a high of 63 degrees to a low of 9 degrees. Talk about a temperature whiplash! Bluefield would set one daily low temperature record and three daily cold high temperature records. And for those at home wondering, the coldest temperature ever set in Bluefield is an incredible 43 degrees below zero set in January of 1937. Now that’s one heck of an air conditioning system! 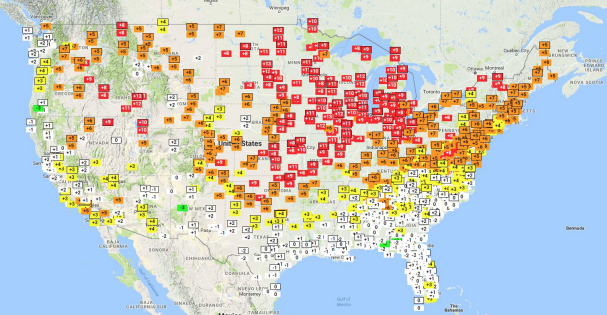 While it stayed hot in the West the entire month, the East flipped and flopped but ultimately ended with the mythical January Thaw. Frequent readers of this column will recognize this wettest city as it has made the list three times in the past 12 months. 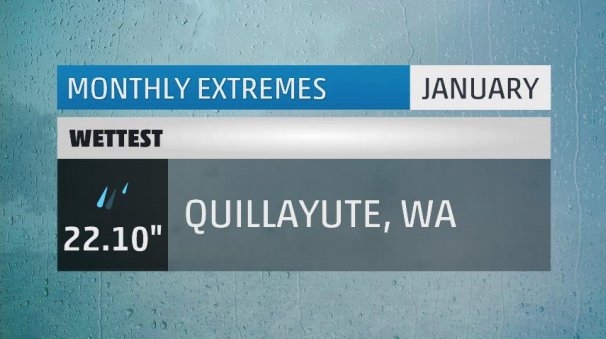 Once again, Quillayute, WA is the wettest place in the U.S. for the month of January. In fact, it was the wettest location for the 3rd month in a row going back to November 2017. For Januarys, it was their 6th wettest on record. Rain fell from the sky on 27 days this month making for the 7th highest number of wet days on record for any January. Seven days had at least an inch of rain which also makes for the 7th most of any January. They also had their 7th wettest January day on record with 4.21 inches falling in a single day. In all, the 22 inches that fell was an incredible seven and a half inches above the monthly average. By the way, Quillayute is, on average, the third wettest U.S. city in any given year. What makes this area so prone to soggy weather? It all has to do with its location. To its west is the vast Pacific Ocean. To their east lies the Cascade mountain range. With the right combination of onshore flow being banked up against the mountains, rain (and snow!) can pour and pour and pour over the region. Hop just to the east of the mountains and it may as well be a desert. Location, location, location. Speaking of dry places, they were quite common this past January. 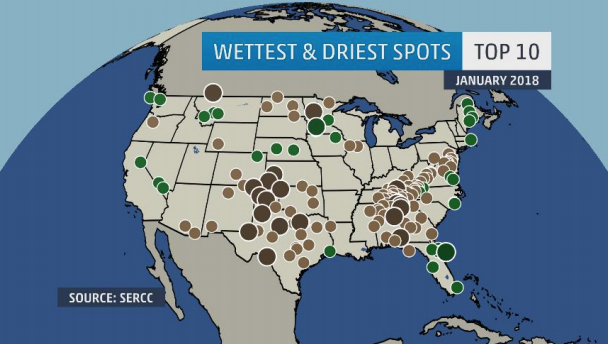 In fact, some 150 cities would have one of their top 10 driest Januarys on record. Out of the dry weather has sprouted quite a widespread drought across the southern tier of the nation with an epicenter in the Texas Panhandle. 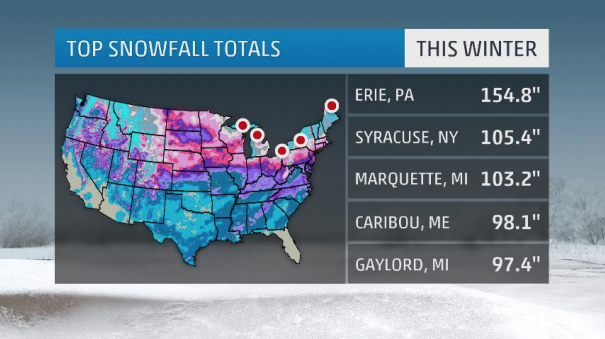 After last month’s incredible showing by Erie, it’s hard to make any location’s monthly snow total seem outrageous. I mean, for comparison sake, the amount of snow our snowiest city received this month was a whole 75 INCHES shy of Erie’s record setting December to remember. 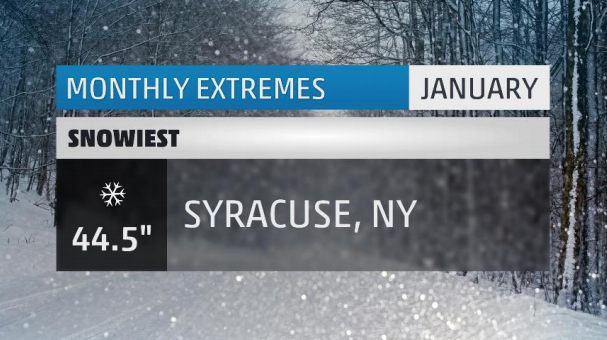 That said, congratulation goes to Syracuse, NY for being our snowiest city this January. For what it’s worth, its noteworthy forty- forty inches of snow is only enough to be Syracuse’s 36th snowiest January on record. So you could say that even for it being the snowiest place in the U.S. this month, it was rather statistically insignificant. That said, it was a busy month for Syracuse as four named winter storm hit the region throughout the month. It started with Winter Storm Grayson which dropped close to twenty inches on top of the city. Another three storms (Hunter, Inga, and Kalani) would drop another twenty inches combined by month’s end. There were sixteen days with measurable snow and twenty-eight days where there was measurable snow on the ground. For the month, Syracuse would finish 10.5 inches above average. This was just the 9th January since 2000 to see above average snowfall. 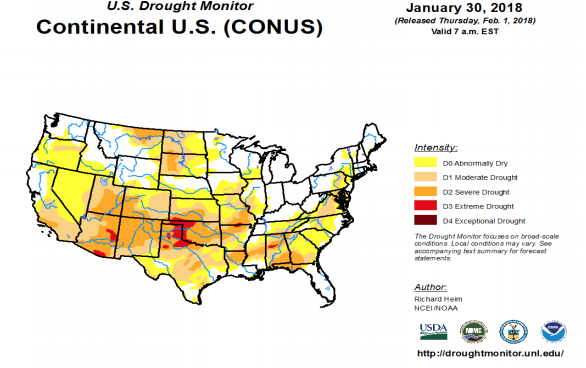 No surprise that we head into the heart of our drought to find our sunniest location in the U.S. for January. 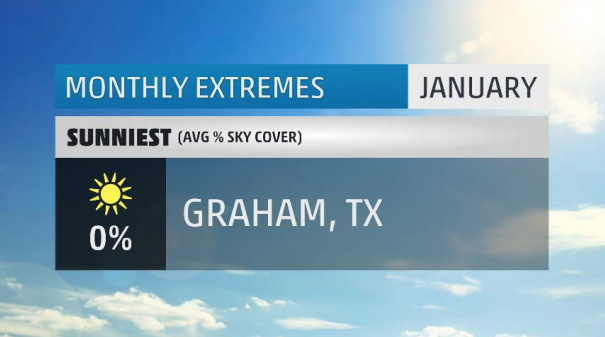 Graham, TX, in fact, was practically cloudless every single day. Thirty-one days ended with an average of 0% sky cover. No surprise again that with a lack of clouds there was also a lack of precipitation. It actually hasn’t rained in Graham since the second week of December. On the average, Graham sees about 246 sunny days per year. Compare that to the U.S. average of 205. Drought notwithstanding, Graham is still a pretty sunny place in any given year. We’ll end in the Northern Rockies where we find our cloudiest location: Kalispell, Montana. This January, Kalispell had seventeen completely overcast days. If you factor out the ONE whole sunny day they had this month, the rest of the days were mostly cloudy or worse. The culprit for the clouds was an active weather pattern that brought precipitation to the town on all but six days. On average, Kalispell is considered to be the 3rd cloudiest winter city in the U.S. behind Olympia, WA and Muskegon, MI. 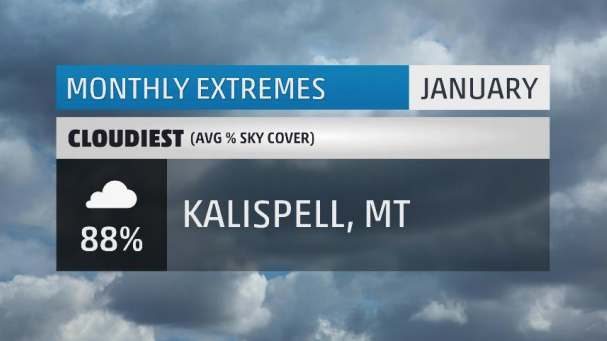 For the entire year, Kalispell takes the 7th spot on the list of cloudiest U.S. cities. In any given year, Kalispell sees 214 completely cloudy days. Compare that to the U.S. average of 160. There you have it, the extremes for the month that was January 2018. Make sure to check back next month to see what February has in store! What weather extremes did you face in January where you live? Let me know in the comments below.